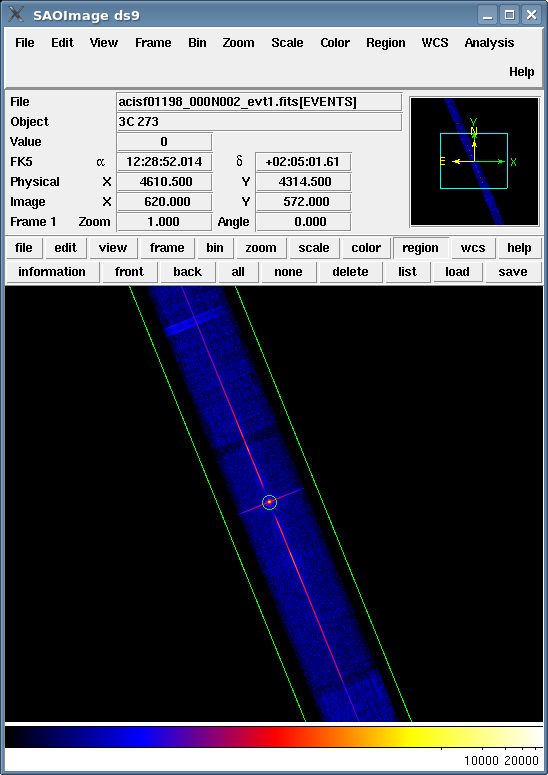 Generate a new PHA2 spectrum file for any LETG/ACIS-S grating observation to ensure that consistent calibration is used throughout the analysis. you are working with an ACIS/LETG dataset and want to create a new level=2 event file and extract a Type II PHA grating spectrum file. Last Update: 10 Dec 2015 - Added a new section discussing the new eventdef options for ACIS+CC mode in CIAO 4.8. The chandra_repro script reprocessing script automates the recommended data processing steps presented in the CIAO analysis threads. The script reads data from the standard data distribution (e.g. primary and secondary directories) and creates a new bad pixel file, a new level=2 event file, and a new level=2 Type II PHA file. chandra_repro also will now create the appropriate ARF and RMF for each grating order and arm in the spectrum using the mktgresp script. The response files will be stored in a tg/ subdirectory of the outdir parameter. Refer to "ahelp chandra_repro" for more information. If you have run chandra_repro you do not need to complete the rest of this thread unless you want to understand the individual processing steps, the options avaiable, or need to apply any non-standard calibrations. This analysis thread starts with the level 1 event file. Before beginning, users may wish to reprocess the data with chandra_repro to create a new event file with the most recent calibration applied. It is also suggested that users set the observation-specific bad pixel file, as described in the Setting the Observation-specific Bad Pixel Files thread. If you do not need to run this thread, go directly to the ACIS-S Grating RMFs thread. To find the zero-order location, the tool tgdetect2 is run. tgdetect2 will automatically select the best tool: tgdetect or tg_findzo. The contents of the parameter file may be checked using plist tgdetect2. Overlay the source list: Region → Load Regions → acis_1198_src1a.fits. tgdetect2 will try to find the best method possible to determine the correct zeroth order location. However, there may be exceptional cases where the results are incorrect. Displaying the region in ds9 will identify such exceptional cases. Users working in crowded fields or with extended objects may find tgdetect2 has strayed from the intended source. These users should manually set the tg_create_mask source parameters as described in the Correcting a Misplaced Zero-order Source Position thread. The location of the spectrum needs to be found next, via the tool tg_create_mask. Overlay the region file: Region → Load Regions → acis_1198_evt1_L1a.fits. Figure 1 shows the regions on the event file. The regions are loaded from the L1a.fits file, which was made by tg_create_mask. The contents of the parameter file may be checked using plist tg_resolve_events. The default "event definition", eventdef, parameter is set for ACIS with data taken in TIMED mode. This is appropriate for this datasets. CC33_GRADED unix% pset tg_resolve_events eventdef=")ccgrdlev1a"
CC33_FAINT unix% pset tg_resolve_events eventdef=")cclev1a"
These CC mode specific event definitions include additonal columns related to the location of the zero order and estimated chipy location. The opt="" parameter in dmcopy and the dmappend command are a workaround for the bug in time-filtering grating data. Users do not generally need to worry about these invalid event unless they are merging observations. Users at this stage may wish to apply other filters via additional dmcopy calls. For example, this would be the appropriate point to apply a time filter to the data. The contents of the parameter file may be checked using plist tgextract. This thread is complete; the PHA2 grating spectrum file is named acis_1198_pha2.fits. You should now proceed to the ACIS-S Grating RMFs thread. # the CCD resolution, used for order-sorting. # that the parameters, osort_hi and osort_lo will be used. #order which will be included in order-sorting via CCD ENERGY values (PHA). #1.7 < order <= 2.2 will be second order, etc. (clobber = no)              Clobber outfile if it already exists? #       "-5, -1, 1, 3"
(inregion_file = none)            Input region file. (extract_background = yes)             Extract the local background spectrum? (min_upbkg_tg_d = default)         Minimum value of tg_d for the background up spectrum. (max_upbkg_tg_d = default)         Maximum value of tg_d for the background up spectrum. (min_downbkg_tg_d = default)         Minimum value of tg_d for the background down spectrum. (max_downbkg_tg_d = default)         Maximum value of tg_d for the background down spectrum. 24 Apr 2013 Updated the chandra_repro section to make it clear the it does all the steps in this thread and that responses are now also created. 13 Apr 2015 Added a note about optional extra dmcopy command to remove rare instance invalid sky coordinates. 10 Dec 2015 Added a new section discussing the new eventdef options for ACIS+CC mode in CIAO 4.8.